'Boring' Singapore City Photo: Cicada or Cricket? 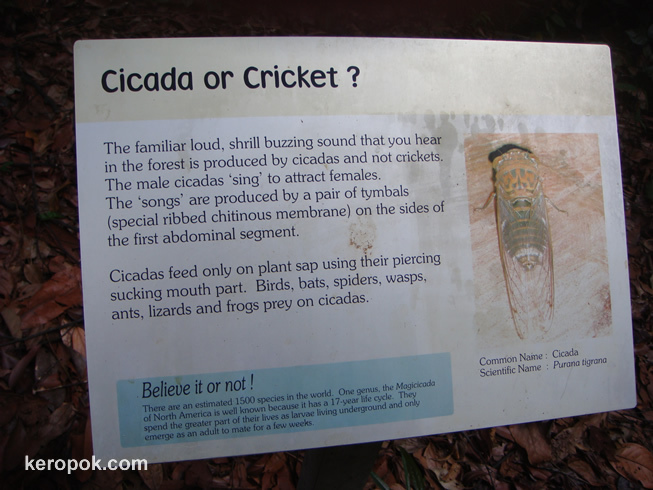 A sign telling us that the sound we hear in the Nature Reserve is not from the Cricket but the Cicada. I find this informative, as I think I am quite ignorant. This was in the Bukit Timah Nature Reserve. So, if you hear the sounds of crickets and cicadas, are you able to tell the difference between the two? I always thought that "cicadas" was just the Japanese word for what we call "crickets". I'm never sure what the difference is though between a "cricket" and a "grasshopper". So now cicadas (tonggeret in Indonesian) start to spread their mating call again! Dry season starts soon then!